The kitchen truly is the heart of the home, and as the Murphys’ house inches closer to completion, they don’t miss a beat when it comes to outfitting their kitchen on a budget. Our house is quickly transitioning from a construction zone to a home. For my wife, Amanda, and I (as I’m sure is the case with many of you), achieving the perfect kitchen is important. Of course, our plans changed quite a bit from our lofty dreams at the start, as the reality of available budget came into very stark view. In fact, in the end we managed to get all of our appliances to total less than the refrigerator I had envisioned originally. And though it’s fun to dream big, we found out that reality can be just as satisfying. So I wanted to share the steps we went through to find the kitchen that would form the core of our home, with a nod towards keeping the budget in check as we made our decisions. To begin, we found we could go from economical to extravagant very quickly. On one side of the scale are completely stock-framed cabinets made from medium-density fiberboard (MDF) with basic hinges and standard hardware. The other end of the spectrum is completely custom frameless cabinets, soft close drawers, high-quality hinges and sliders, plywood construction, custom shelving and storage solutions and premium woods with equally premium finishes. Spending six figures on your kitchen is a whole lot easier than you might think. But if you’re like us, and you need to find a way to get a durable, beautiful kitchen at a reasonable price, be prepared to do some comparison shopping and make a few tough decisions. The guiding principle Amanda and I used in making ours was to constantly come back to how we really envisioned using the kitchen, especially with three young kids who’d inevitably bang it up, make a mess and break things in ways we couldn’t currently imagine. In other words, this was going to be one highly utilized space, and likely one we’d redo in 15 years. Fully custom cabinets? Nope. Fancy top-of-the-line appliances? Not here. Cast-concrete or quartz counters? Not quite. We chose to take a middle-of-the-road approach. Our cabinets are considered semi-custom (or semi-stock depending which manufacturer you talk to). You can get them from a Lowes or Home Depot, but we went with a local kitchen designer who we could walk through the log element of the design and who could modify our stock plans to fit the cabinetry manufacturer’s specs. We chose a frameless plywood box, which creates a more spacious cabinet; upgraded the hinges and gliders for soft-close functionality; added some pantry and spice pullouts; and chose a fairly classic door style. We also opted for a nice glaze to add some character. One thing that made me chuckle was that “rustic” wood variants (i.e., those with knots, wormholes, grooves, etc.) are an upcharge to the clear option of the same wood. Go figure. Our appliances are GE Profile Slate, chosen specifically because of their resistance to fingerprints and are a rich, warm gray rather than cool silver. 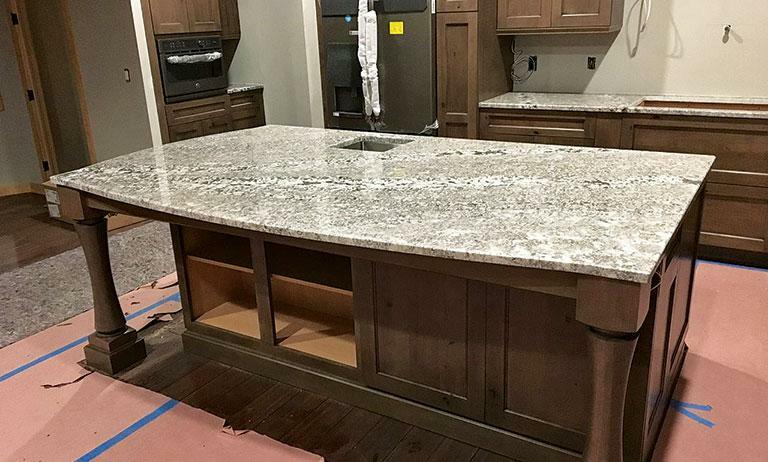 After exploring every countertop option from laminate to wood to quartz, the material we selected is a beautiful mottled granite we found at a local stone yard. The cost of granite can vary widely, and slabs aren’t usually marked with prices. It’s best to ask your salesperson to limit you to the mid-grades if you’re watching costs, or you might fall in love with one that’s well out of your price range. (Yes, this is from experience.) We were shocked to learn that manmade quartz is not necessarily cost advantageous. In our case, the natural granite we chose was less expensive than quartz, which took us by surprise. With our kitchen selections made, we were extremely pleased once the installation began. As the kitchen took shape, we could start to envision the kids doing homework at the island, making pancakes on a Saturday morning or cooking our Sunday-football pasta dinners. Yes, our kitchen would become the center of the home that we always envisioned it would be, and best of all, we could achieve it at a price we could live with. Plumbing choices can add cost to a kitchen. Undermount sinks are a fantastic option that makes for clean lines (and easy maintenance), and they are typically priced lower than drop-ins. However, be aware that the granite countertop fabricator will charge a bit more for each sink cutout, since they have to finish the edge. Also make sure your faucet choices have the clearance needed to move the volume handle through its full range of motion before the stone guys cut the holes. As the adage goes: Measure twice; cut once! In our August issue, Sean shares some of the concessions he and Amanda had to make along the way to ensure they could cross the finish line on budget and still love the house they’d dreamed about.